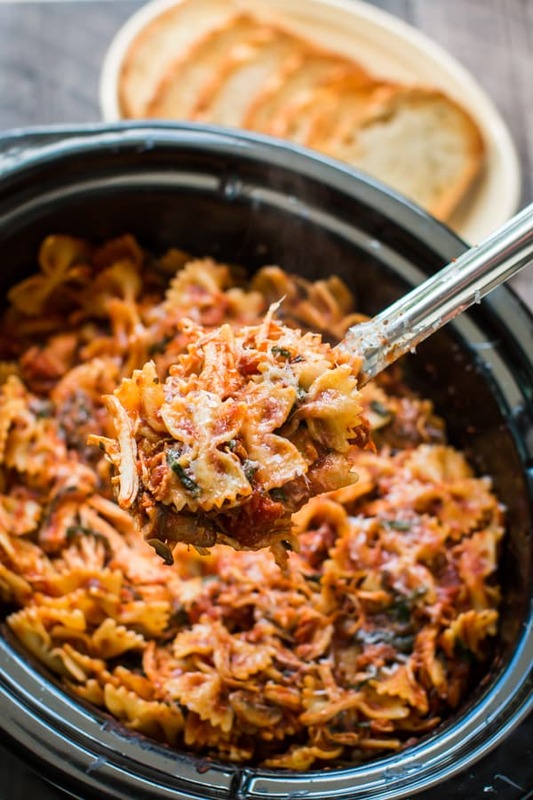 Slow Cooker Chicken Bacon Pasta! Hearty Chicken, bacon, mushrooms and spinach with pasta in a tomato sauce. Great for feeding a crowd. Ready for another pasta recipe? You won’t be disappointed with this meal. 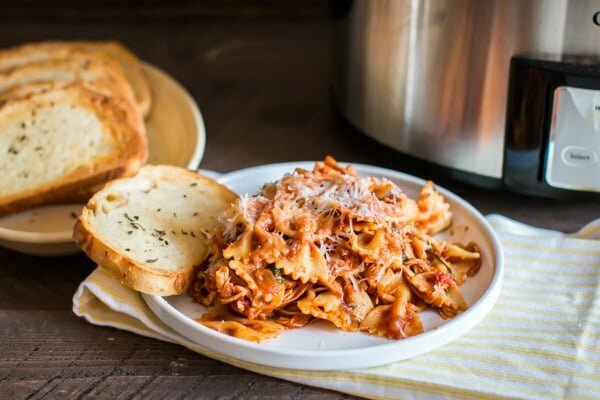 I used Homestyle Ragu Pasta sauce for this recipe, which was the perfect consistency and flavoring. My mom would always make pasta if she wasn’t making my dad’s favorite foods. I would always look forward to dinner on those nights. I miss living at home for that very reason! I try to make pasta once a week for my family since it is their favorite, and the leftovers are great for my husband’s work lunches. This meal starts by laying down the chicken, seasoning it, then adding red onion, mushrooms and bacon. I then pour over 2 jars of Homestyle Ragu pasta sauce, the Thick & Hearty Traditional. You can use any of the Homestyle varieties, see the choices here. I want to try the 4 cheese next time. After the chicken and sauce cooks, I shred the chicken, stir in parmesan cheese, sliced baby spinach and cooked bow-tie pasta. Then top with more cheese. This meal makes enough for 8 or more people! Plenty for leftovers during the week. Here is my video about how to make this meal! You can follow me on YouTube here. Doesn’t this meal looks easy? 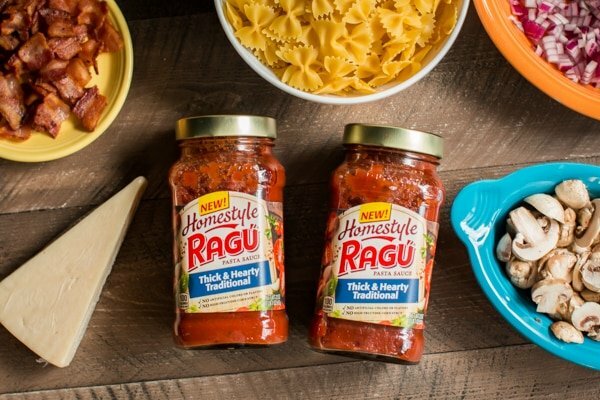 What Homestyle Ragu pasta sauce would you choose for this meal? It’s always such a hard decision which to pick. 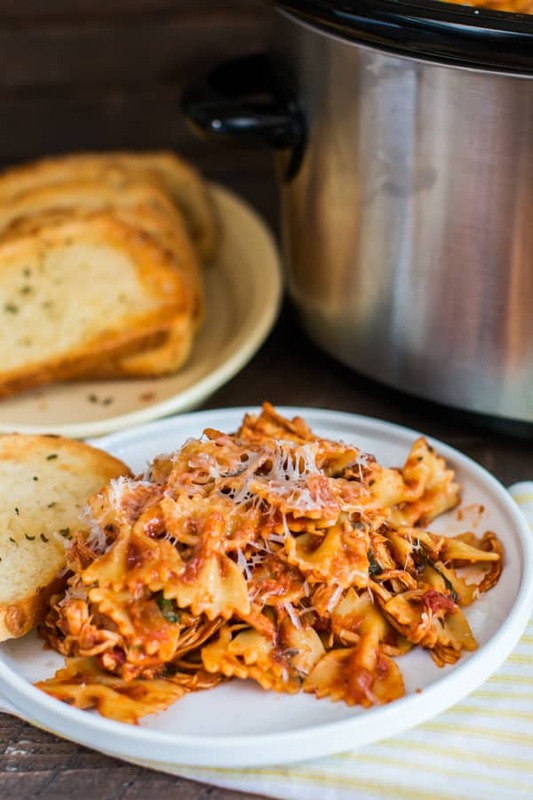 There is many more great recipes on the Ragu Website if you need more ideas for dinner. Have a great week! I will have a new recipe for you in a few days. 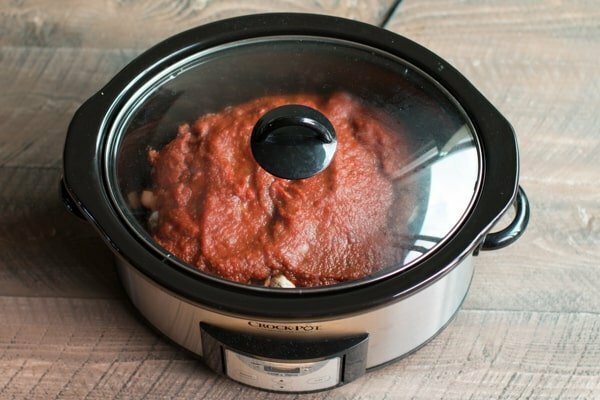 Add the chicken to the slow cooker. Sprinkle over the salt, pepper, garlic powder, thyme and oregano. Add the red onion, mushrooms and bacon. Pour over the pasta sauce. After the cooking time is done, shred the chicken with two forks. Sprinkle over the parmesan cheese and sliced spinach. Add the cooked and drained pasta. Stir everything until it is combined. Add more parmesan cheese to the top and serve! That looks amazing and I absolutely loved your video! Thanks for sharing! I know my husband will just love this! I have a few jars of that amazing Homestyle sauce myself! we love it! Does Ragu make an Alfredo Sauce? Tomato sauce is the only part of Italian food that my tummy just can’t seem to take. I don’t have that problem with Alfredo Sauce. Thanks Karen. I did find the two Alfredo sauces. Haven’t seen the Creamy Mozzarella or Roasted Garlic Parmesan yet, but I’ll be on the lookout next time I shop! Yes, I do think it would work fine, the sauce is liquidy so I think it would do well for longer on low.